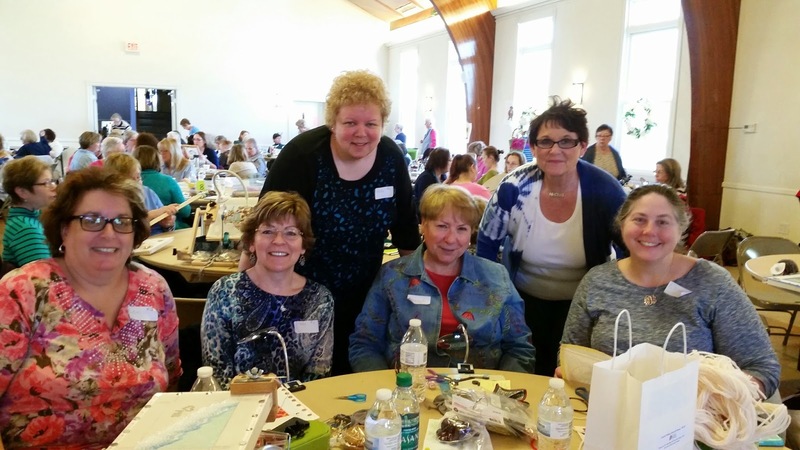 April 26, 2015--Just returned from the NJ Needle Festival put together by Susan Hoekstra and held this year on Saturday, April 25, 2015, in Bedminster, NJ . Had a wonderful time with my 5 table mates--Lori, Linda, Melita, Naomi and Elizabeth (pictured below). Even though the festival ran from 9:30 am to 4:30 pm, we certainly didn't spend all that time stitching. Telling stories, walking around to see what others were working on, visiting and shopping at the many vendor booths, eating lunch, winning raffle drawings, etc., kept us very busy all day. And speaking of raffles, yours truly won a beautifully hand hooked wool rug. Almost lost it though because I was in the rest room when my name was called. Thanks to the wonderful ladies at my table, they convinced Susan that I had not left the festival and would be returning any second. It was fun to walk into the room to find everyone loudly yelling (happily) at me to hurry up because I won a raffle drawing.